WBU’s surrounding area offers a number of attractions to interest visitors. History ranging from the 1800s to World War II to the origins of Rock ‘n’ Roll is all on display here and in very interesting fashion! There are also great opportunities to get outside and enjoy nature. 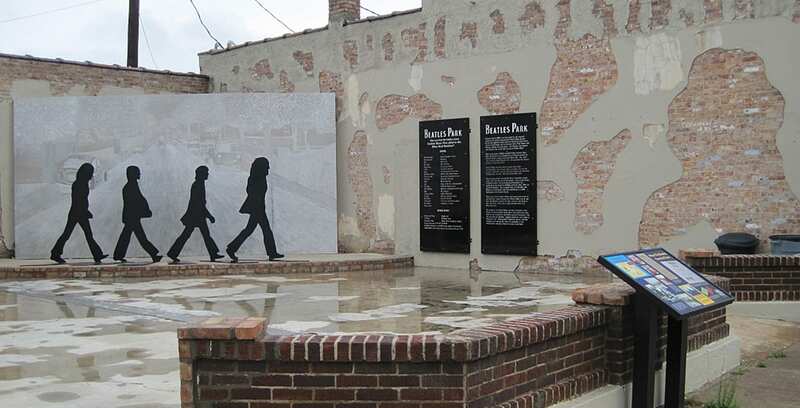 Beatles Park features a massive sculpture in the likeness of the Abbey Road album cover. Make sure you take time to find the lyrics and song titles hidden in the hand-etched background! The Beatles tribute recalls the 1964 visit to Walnut Ridge Airport by the famous rockers, and the park features photos and history from that day. Admission is free. Guitar Walk at Cavenaugh Park is a 115’ long walkway in the shape of an electric guitar, detailed right down to the metal strings. The walk features informative tributes to rockabilly legends like Elvis Presley, Jerry Lee Lewis, Johnny Cash, and six others who performed in and around Walnut Ridge during the early days of rock ‘n’ roll. The Guitar Walk includes an audio tour narrated by Sun Studios recording artist Sonny Burgess. Admission is free. Located very near the Williams campus at Walnut Ridge Regional Airport, Wings of Honor Museum preserves the history of the World War II-era Walnut Ridge Army Flying School and the entire war effort. A large and impressive collection of weapons, uniforms, vehicles, posters, and other war artifacts are set in fascinating displays, along with a detailed history of WWII. Admission is free. Powhatan sits on the banks of the Black River. A beautifully restored courthouse, built in 1888, is the centerpiece of the park. Other historical structures include the old jail, circa 1873, the Powhatan Male & Female Academy, built in the 1890s, and other interesting 19th Century buildings. There’s a fascinating museum in the courthouse, and park tours are available. Documents dating back two centuries are also housed at Powhatan in the recently completed Northeast Arkansas Regional Archives. Within 20 minutes of WBU. The 600-acre Lake Charles has great fishing, as well as modern campsites, picnic areas, hiking trails, a swimming area, and a pavilion for gatherings. There’s also a nature center and gift shop, and interpretative tours are available. Within 30 minutes of WBU. The Downtown Playhouse stages several entertaining productions each year, and the theater itself is worth the visit. All the seats have a great view of the stage, and coffee & dessert are part of the cost of admission! Within 15 minutes of WBU. This site of the former St. Mary’s Church & Pocahontas Colored School is now a cultural center and museum to nearly two centuries of African American history in Randolph County. Special events are held throughout the year, and tours are available. Admission is free. Within 15 minutes of WBU. Davidsonville is the site of an early 1800s settlement on the Black River. The park features a fishing lake with pedal boat, canoe, and kayak rentals, campsites, and hiking trails. Tours are available. Within 30 minutes of WBU. This 6-mile walking and bicycling trail extends from College City all the way to Hoxie. All but a small portion is paved, and the full trail is easily accessible. The trailhead near WBU is at Miller Road, near the Contech plant. The Walnut Ridge city park has a pavilion, lake and a large walking trail. Baseball and soccer fields are also at the park, and the swimming pool is open in summer months.